Crafts is a living and permeating practice in Oaxaca. You cannot escape it. Every town remains true to their iconic crafts, from textile to ceramic to woodcarving, dyeing and glass making and more. 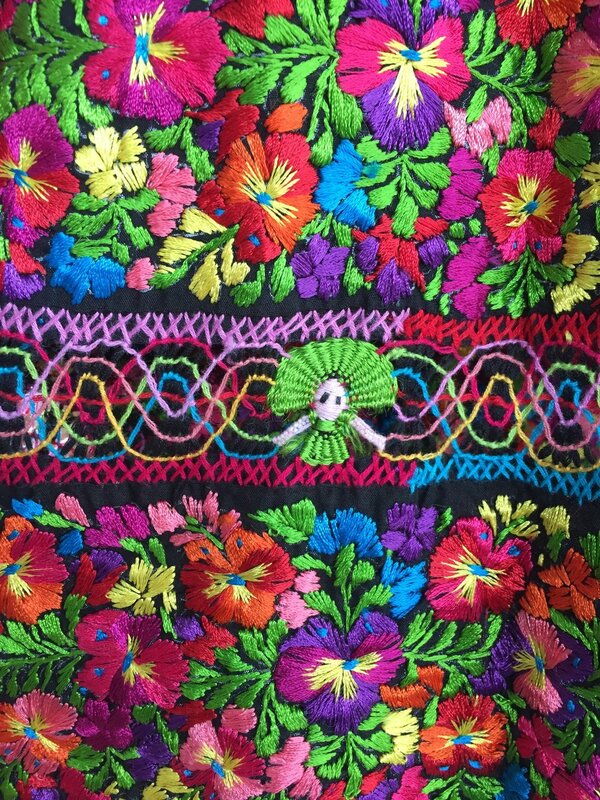 The signature cloth of San Antonio Castillo Velasco is a tightly packed rainbow-tones floral embroidery. Miriam Campos, who comes from a family of embroiderers, introduced me to her family during my last visit. Miriam’s mother Reyna Cornelio, grandmother Virginia Sanchez, and all aunties are established designers and embroiderer of this craft, supplying fine work for museums both domestically and overseas. 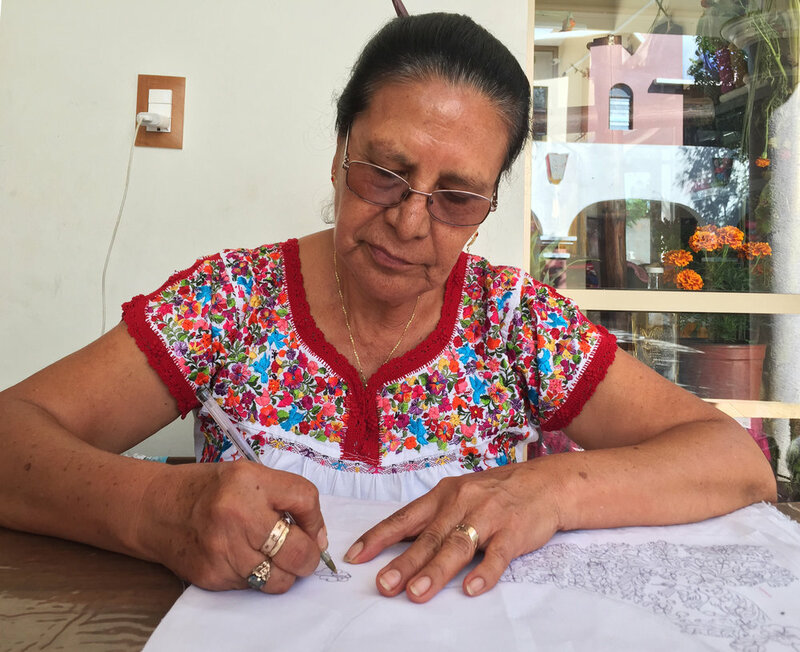 At her home, Reyna enthusiastically demonstrated drawing her signature patterns on the fabric. For the flattering floral embroidery that is covering a traditional blouse, 4 main needlework techniques are used: open thread work, flat embroidery, crochet and decorative smocking. The drawing of patterns is the key, done by the designing artisan with her signature motifs/styles. She then usually pass on to an embroiderer with the coloured threads. But the choice of where colours go is mostly the embroiderer’s decision. So the colour combos are the embroiderer’s express. Therefore, each piece (unless is for competition or exhibition) is collaborative work in the family or community. It's interesting how the global (western) term in craft trade would call Reyna the designer, where she is called an artist here. It reflects a fundamental difference in concepts: not only each piece started from hand drawing therefore unique, but there is also so much creative liberty embedded in the nature of making. Same case for the embroiderer in colour pairing. The teamwork is community building. The 'labouring' is artistic innovation, dare I say. It touches onto ways of thinking about intellectual property and scaling production. My visit coincided the third day of Dia de los Muertos (the Day of the Dead). 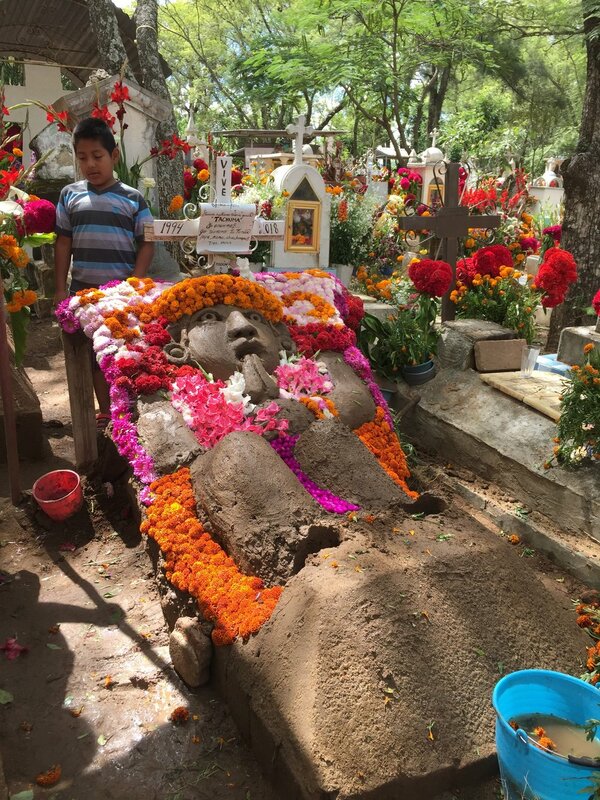 On this day, the San Antonio Castillo Velasco community takes part in a grave decoration competition in the cemetery, where families would come together to create floral art to cover their loved ones. It is a valuable practice to respect, adorn and 'spend time with' those who passed.